▶ SoldThis listing was sold on Nov 15, 2017 for the price shown here. 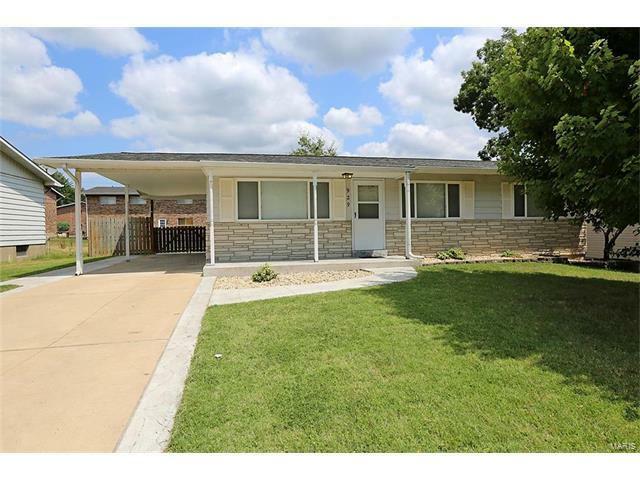 Check out this well maintained 3 bedroom, 2 full bath Ranch, located just 5 minutes from 270. Approx:1,600+ finished sq. ft. Many practical features, make this a great home for a growing family to stretch out in. Upon entering your greeted with neutral walls & natural lighting. Laminate flooring, flows throughout living room, hallway, some bedrooms and lower level finished spaces. Updated kitchen featuring Oak cabinets, gas stove, microwave, dishwasher, backsplash, breakfast bar, breakfast room and ceramic tile flooring. Additional Features: Freshly painted interior, new carpeting, attic fan and atrium doors that lead to the king size concrete patio. All windows have been updated. Good size, recreation room on lower level with two additional rooms, perfect for home office. Level fully fenced yard, perfect for entertaining and family fun. From 270 exit, left at McDonnell Douglas/Howdershell. Left on Chula Drive.